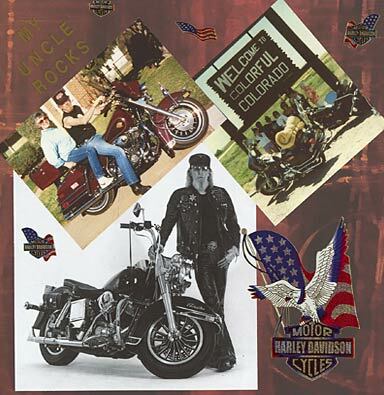 After seeing the great selection of Harley Davidson scrapbook stickers available on the internet, I just had to make a layout about my uncle's passion for his 'King of the Motor Cycles'. NOT THE TIME FOR FLORAL PAPER! I know there's plenty of women who ride and love Harleys, but I went for a dark, rich and broody red/brown paper from Dovecraft - my current favourite paper supplier. Don't attempt a Harley Davidson layout without some peel off stickers (Free Government health warning). The ones I used are from the extensive embellishment range from EK Success, though suppliers like Jolees have a decent selection also. Layouts often take me twice as long to do because of the times I keep changing my mind on what the 'big picture' final result should be. Then up steps Jen Gormley with her excellent '500 Scrapbooking Sketches' and now I don't have an excuse not to pre-plan my page. In fact, if you look at this page about half way down, you'll see how Jen has fashioned a great layout from a simple line drawn template - a template she can then use for many other themed layouts. And so can we! If I'm honest, these three photos wouldn't ever really go on the same page other than the fact I wanted to do this layout and these were the pics to hand. The black and white central photo probably deserves its own page - it's so 'Rock 'n Roll! The photo of my mother riding on the back is perhaps less so. With a Harley layout, the embellishments are central to the 'Look and Feel' of your page, so a page kit is probably a good idea. The internet will come to your rescue if your local scrap shop doesn't shape up!